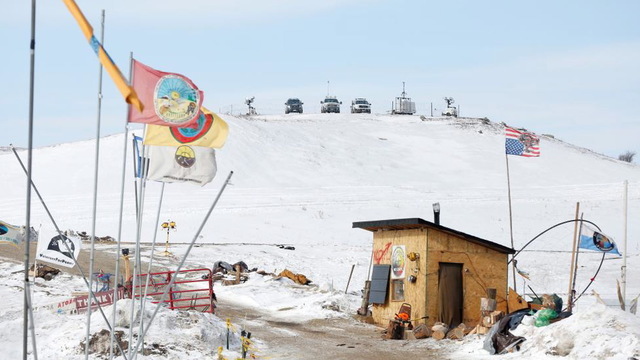 After class a couple of weeks ago, one of my students asked me why the Winters decision had not played a larger role in the Water Protectors’ efforts to defeat the Dakota Access Pipeline. The students had read Winters v. US (1908) and they had been following closely developments at Standing Rock in their current events reading. I have been teaching college history for a long time, but I am still reminded quite often how much there is that I do not know. My very best students frequently drive me back to the piles of books in my office, or to the library, or to the wonderful world of resources available online. Sometimes their questions force me to ask my friends—historians, anthropologists, and, in this instance, lawyers—for guidance. I learn a lot through teaching. It is why I am so happy and feel myself so fortunate to be at Geneseo. How did it do that? The Court held that when Congress established an Indian reservation, it established as well a right to the water necessary for that reservation to achieve its purposes. Since one of the stated goals of the reservation policy involved leading native peoples towards what the federal government and many reformers considered a civilized way of life—and in this instance the native peoples in question were the Gros Ventre and Assiniboine communities residing near the Milk River on the Fort Belknap Reservation—that meant guaranteeing them the water they needed to undertake stock-raising and agriculture. Thus the Winters Doctrine. Settlers upriver had diverted waters from the Milk River and this, the Court held, was unlawful. So at the very time that Congress was seeking to dispossess native peoples and eradicate their culture, the Court, in this quirky case, recognized that these reservations had a claim to water superior to that of the settlers who coveted this vital resource. Water is essential on the plains. As the Water Protectors have asserted, “water is life,” and in their view, the Dakota Access Pipeline jeopardized waters flowing through the reservation. As early as 1976, according to Carvell, the Standing Rock Sioux Tribe asserted that it controlled water and other natural resources on its reservation. The Standing Rock Sioux that year began demanding that all users of water obtain the approval of the tribal government. It is not difficult to imagine that an oil spill or a pipeline break upriver would threaten these water resources. Pipelines break. They leak. Oil spills. It has happened in the vicinity of the Dakota Access in recent months. It is obvious that these accidents would threaten tribal water resources. But North Dakota is unique in terms of western water law. The amount of water to which tribes in North Dakota are entitled has never been quantified, and as a result, one might argue that the Winters doctrine has, strictly speaking, never been applied to Standing Rock and other reservations in the state. The efforts of the Water Protectors and their lawyers to obtain restraining orders to prevent the completion of the Dakota Access pipeline did not address these issues. Nor have treaty guarantees and other matters received a full airing in court. Needless to say, if the Dakota Access Pipeline is completed, and it is beginning to look like that is what is going to happen, many of the most pressing historical and legal question will not have received a full hearing. And that, along with President Trump’s determination to undermine the Environmental Impact review, makes this episode even more disappointing and unfortunate than it otherwise might have been. So what is the answer? You say the doctrine wasn’t cited in their legal arguments against the pipeline, but do we know why? Cited in their legal battiles against DAPL. It was that question that perplexed me, Leah. I asked around quite a bit, and could not find anything in the news coverage. That is why I decided to investigate and dig a bit deeper. I spoke to an attorney friend of mine and, as I understand it, the reason Winters has not been brought up is because the litigation thus far has been directed towards obtaining temporary restraining orders to halt the digging of the last portion of the pipeline. In the effort to obtain the restraining order, the actual merits–and that could be arguments based on Winters or other court cases, or the Fort Laramie treaties of 1851 and 1868–are not presented. I am not an attorney, and I am open to learning from you, if you have found something different. But it sure seems like on its face that the Dakota Access Pipeline threatens the water rights of the Standing Rock Sioux in fundamental ways. Thanks for reading the blog. And thanks for your contribution. If I learn anything else, I will be sure to share it with you.